Another month, another Mixology Monday. This MxMo's theme is still Vermouth, hosted by Vidiot at Cocktalians. This is my second drink for this month's MxMo, using Italian vermouth this time as opposed to my first, the Green Lantern, which used Dolin Blanc. Both of these are doing double duty in another way, since I mixed them up for recent TDNs. I came up with the League of Extraordinary Gentlemen for the rather wide open category of Thursday Drink Night: Clear Spirits several weeks ago. I was lucky to have procrastinated posting it, because now I get to use it for MxMo as well. 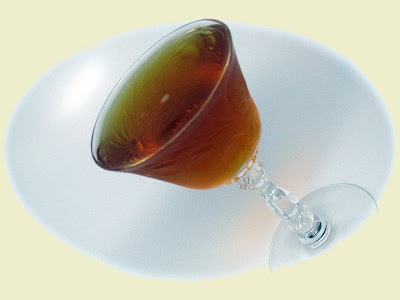 Stir and and strain into cocktail glass. When I initially presented this drink it was met with much skepticism due to the admittedly scary looking combination of several very boldly flavored ingredients, which do not at all obviously look like they would go well together. Thus the name. But once a couple guys got over their apprehension and tried it most quite enjoyed it, even extolling others to try it because despite its daunting recipe it is "actually good - honest. You should try it. Really." Although it did make one guy sneeze. Never found out if that was bad or a positive endorsement. Anyway, I enjoy it, and I liken it to a smoky manhattan. Anyway, on to the discussion of the vermouth. Carpano Antica is still a sweet, or Italian vermouth, but it's made from a base of red wine as opposed to the more typical white. In addition, it is spicier and more robustly flavored than your typical Italian vermouth. And just plain better, it's great stuff. I mentioned at the most recent TDN that it was my default and the response was that it should be everyone's. I think the Carpano is key to making this drink work as the dude who ties all the other guy's big flavors together and keeps them all in line. And note, I am well aware that the movie is pretty bad but I quite enjoyed watching it, it's in my wheelhouse, like almost all vampire stories, except of course Twilight which I have not seen but I'm quite sure is utter garbage.